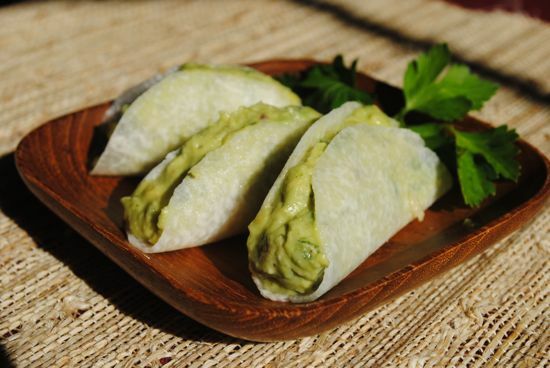 These little Guaco Tacos are easy to make grain free, gluten free and dairy free and are perfect for anytime. These are great if you have just made your guacamole or if you have some left over from your big game party! You will absolutely love these. I first had a version of these little bundles in LA at José Andrés restaurant The Bazaar (review coming soon). Of course he had a really creamy version of guacamole in his little bundles and they held together like a little pouch. He added a little crunch into the bottom with some crumbled Fritos. I tried that and it was good but the secret to the crunch is really in the “shell” so you can keep it grain free by not using them. So the secret to the crunch is the “shell”. It’s thinly sliced jicama. Yep you read that right. All you need is a way to slice them. A mandoline or V slicer works great. They are as much fun to make as they are to eat. Just in case you don’t eat all the ones you make, they will still be crunchy the next day. Jicama is a great vegetable to use for this too because they will not discolor. Now that I’ve shared this little secret can you just imagine all the fun things that can go into thin slices of jicama. But for these grab your guacamole recipe and lets get started. After you peel the jicama slice it as thin as you can. Next I lay out some slices onto a plate and if you want to add in crunched up Fritos do that first. Then spoon on a teaspoon of guacamole. You can top each one of these with a sprig of fresh cilantro or just the plate. Pick it up and shape as a taco or whatever you fancy. These make a great snack, topping to your favorite Mexican dish or even potato skins. Let me know how you use them. Melissa when you're on your book tour here on the east coast I'll make the food for the party! As for the circles I really had nothing to do with this. I just peeled the jicama and sliced it. It makes small to large circles. The trick was finding one that was small enough to fit on my mandoline. Sometimes they have very large jicama at the grocery store. I love the idea of wrapping it around chicken! I think we're both going to have fun with this. I think I'm going to play with slicing up some golden beets too and see what we come up with. You game? Holy green goodness! That looks delicious! Thank you Bat Girl. To the Bat Cave and we'll have some! You two have me wanting to get a jicama and go crazy. I think this would be good for breakfast–right now. Oh Wendy, go crazy with it! Have fun for breakfast. Hmm, I do have left over slices. I bet it would be fun with some scrambled eggs, a small crumble of bacon and a dab of guac. I think I'm having that now. See now I'm going crazy. Isn't it fun to go crazy with food!!!! Let me know what you make. Alta it can be a little hard to stop but I find I eat way far less of these than if I'm dipping a chip into the guacamole. I guess because I'm getting all real food. OK, shhhh we won't tell anyone. Hmmm you do look like you're not feeling well. Maybe you should go home. Diane, you just rocked my world! I see jicama all the time at the grocery store, and walk past because I don't know what to do with it. But this looks like the perfect way, and I am definitely buying some next time! Iris have fun with this. You need something a little wet to make it hold together but just think of the possibilities. I can't wait to see what you come up with. When you posted the picture on FB last night I was wondering what the "shell" was. I LOVE jicama! My dad used to make sure we had it in the house often when I was growing up. I love adding it to salads and other dishes for the "crunch." 😀 It looks like I need to get my mandoline out and really learn how to use it without it tearing up my food instead of making it look pretty. I had a fancy hard to use mandoline and I swapped it out for one from OXO. It's really easy to use so I get it out more often. Just always use the finger protector with any mandoline! I can't wait to see what you create. Wow, I can't believe how creative this is! I need to get a mandoline. This recipe/concept is simply brilliant! Can't wait to try it!!! Hubby can have his corn taco shells while I enjoy this grain-free version! Thank you, Diane! Off to share! I need to try jicima as a taco shell, it sounds great! Great idea Diane! So fresh and simple to do and looks pretty as well. Bravo!